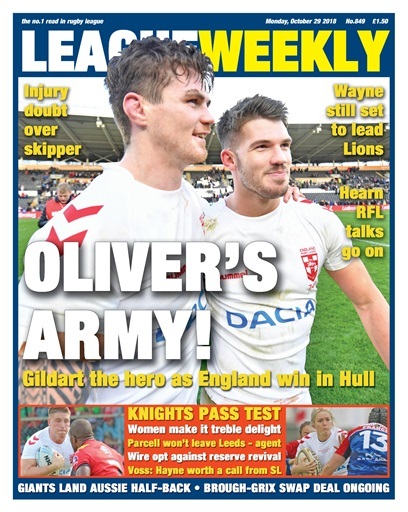 ENGLAND are 1-0 up against the Kiwis ... we reflect on their first test win at Hull, with full reaction and analysis from the KCOM - including interviews with try hero Oliver Gildart, Wayne Bennett, George Williams, Jake Connor, Elliott Whitehead, Josh Hodgson, Luke Thompson and more... Were England 'lucky'? One Kiwi reckons so! Will the men in black respond at Anfield? Time will tell as we look forward to the second test. 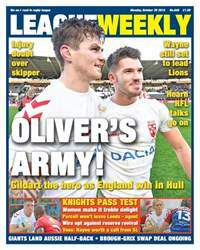 RFL CEO Ralph Rimmer gives an update on the Lions tour and his talks with the Hearns, plus we bring you all the action as the Knights win in PNG and England's Women make it a perfect weekend with victory in France. Meanwhile, there's European Championship joy for the French and the irish. Back home, Huddersfield complete the signing of a new Aussie half-back ... will that allow Danny Brough to complete his swap with Wakefield? Matty Parcell's agent denies he'll be on his way out of Headingley as the Rhinos look to bag an NRL prop, and there's news on Warrington's reserve team plans (or lack of them!) for 2019. Andrew Voss floats Jarryd Hayne for Super League, Dave 'Nosey' Parker brings all the latest gossip, and there's full coverage of the NCL's annual awards evening.